Now a day, not only those persons who belong to computer industry but a man in the street is also talking about the internet of things (IoT). Here it is obvious that the knowledge of layman about IoT is somewhat superficial. Experts of IT and computer programming will not be going to communicate the science and societal aspects of this new wave of Io T. Hence the role of science communication comes into the picture. In general, present time ‘internet’ has a fairly limited scope. It deals and describes 5W (What, When, Why, Where and Who) and 1H (How) about the world around. Moreover, it works only in virtual world. In its core, it connects only people. But IoT has a wider reach as it also includes connections beyond the person, industry such as wearable devices on people. In this way, we can understand that IoT has enabled virtual world to connect with physical world. In this to happen, sensors and actuators embedded in physical objects are linked through wired and wireless networks. The term Internet of Things was invented in 1999 and initially it was used to promote RFID technology. The popularity of IoT is accelerated in 2010s and reached to the mass market. Till 1970s, the idea of connected devices was often called embedded internet or pervasive computing. But the actual term Internet of Things was coined in the year 1999 by Kevin Ashton. The saga of the Internet of Things is 16 years old. Ashton was working in supply chain optimization and he wanted to attract senior management’s attention to a new exciting technology called RFID. Because the internet was the hottest new trend in 1999 and because it somehow made sense, he called his presentation Internet of Things. Although Kevin grabbed the interest of computer stalwarts but this magical term IoT did not get widespread attention for the next 10 years. The concept of IoT leaked in 2010 when Google’s Street View service had not only made 360 degree pictures but had also stored tons of data of people’s Wifi networks. People started debating whether this was the start of a new Google strategy to not only index the internet but also index the physical world. In the year 2011, Gartner(a global market research company) invented the famous hype-cycle for emerging technologiesand included a new emerging phenomenon on their list that was Internet of Things. 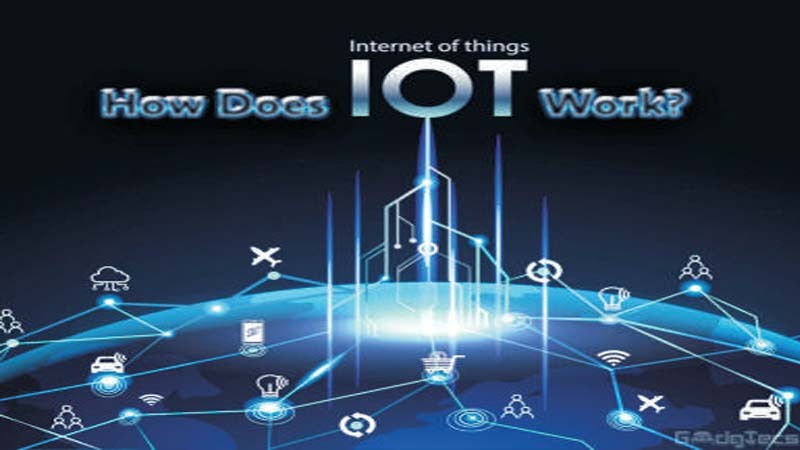 In the forthcoming years IoT got popularity through various ways. Europe’s biggest Internet conference LeWebwas organised on the main theme of IoT. Simultaneously Forbes like globally acclaimed magazine started using IoT in its vocabulary. In this way, IoT gets momentum in its popularity in a short time period. IoT: How does it work? Smart Device and Sensors: Devices and sensors are the components of the device connectivity layer. There are several technologies that enable Internet of Things. Crucial to the field is the network used to communicate between devices of an IoT installation. Here several wireless or wired technologies fulfil this role. RFID-tags and unique identification through the Electronic Product Code become the basis of this technology. Obviously it has evolved into objects having an IP address or URI. Internet Protocol version 6 (IPv6) is the most recent version of Internet Protocol. It is a communications protocol that provides an identification and location system for computers on networks and routes traffic across the Internet. In context of IoT, its future will not be possible without IPv6 and consequently, the global adoption of IPv6 in the coming years will be critical for the successful development of IoT in the coming future. The applicability of IoT in our everyday life is tremendous. IoT enabled devices are often divided into consumer, commercial, industrial, and infrastructure spaces. Smart devices or Connected devices are designed in such a way that they capture and utilize every bit of data which you share or use in our day to day life. This new wave of connectivity is going beyond laptops and smart phones. In such IoT based connectivity, cars, smart homes, wearables, smart cities and healthcare will be connected. In other words, IoT will connect our life. It has been predicted that by 2020, connected devices across all technologies will reach to 20.6 billion. Imagine about a home, if you could switch on air conditioning before reaching home or switch off lights even after you have left home? Or unlock the doors to friends for temporary access even when you are not at home. Don’t be surprised with IoT taking shape companies are building products to make your life simpler and convenient than today. Smart Home has become the revolutionary icon of success in the residential spaces and it is predicted Smart homes will become as common as smart phones. The automotive digital technology has focused on optimizing vehicles internal functions. But now, this attention is growing towards enhancing the in-car experience. The connected car is a vehicle which is able to optimize its own operation, maintenance as well as comfort of passengers using onboard sensors and internet connectivity. Most of the car manufacturers are working on connected car solutions. Major brands like Tesla, BMW, Apple, Google are working on bringing the next revolution in automobile industry. Around the world, wearables have experienced an explosive demand in markets. Companies like Google, Samsung have invested heavily in building such devices. In days to come, wearable devices will be installed with sensors and software which collect data and information about the users. This data is later pre-processed to extract essential insights and wish about user. These devices broadly cover fitness, health and entertainment requirements. The pre-requisite from internet of things technology for wearable applications is to be highly energy efficient or ultra-low power and small sized. Smart city is another powerful application of IoT. A few examples of internet of things applications for smart cities are Smart surveillance, automated transportation, smarter energy management systems, water distribution, urban security and environmental monitoring. IoT will solve major problems faced by the people living in today’s cities like pollution, traffic congestion and shortage of energy supplies etc. Products like cellular communication enabled Smart trash bin will send alerts to municipal services when a bin needs to be emptied.Through installing sensors and using web applications, citizens could find free available parking slots across the city. Also, the sensors can detect meter tampering issues, general malfunctions and any installation issues in the electricity system among the buildings of apartments. Agriculture sector will also get benefitted with the application of IoT. Increase in world population is rising day by day and with this rise, demand for food supply is also being raised. Smart farming is one of the beneficial applications in which IoT is used. In this, farmers are using meaningful insights from the data to yield better return on investment. Soil moisture and nutrients related sensing, controlling water usage for plant growth and determining custom fertilizer are some simple usage of IoT. In the healthcare sector, there is enormous scope by the Internet of Things applications. Research reflects IoT in healthcare will be massive in coming years. IoT in healthcare is aimed at empowering people to live healthier life by wearing connected devices. The IoT enabled collected data will help in personalized analysis of an individual’s health and provide tailor made strategies to combat health misery. We all know India is a diverse country with varying needs. That creates a humongous number of use cases which can be addressed only through convergence and complete integration of technology. Interestingly, India is getting a strong impetus towards improvements of wireless connectivity across geographies. Wide scale proliferation of internet enabled devices is driving the standards bodies to evolve robust standards around data security.